You not only need to have a website for your business, but you need to have a great website. How your website looks and functions will help people make decisions about how professional and trustworthy your business is. A small business will gain credibility if their website is well designed, which could help increase their client base and their profits. So, what type of experience do your clients and prospects have when they visit your website? Do they get a feeling of professionalism and trust, or do they bounce, frustrated and unsatisfied? Here are five things you should focus on when you are designing a new website, or re-designing your existing one. Does your website project who you are as a company? Do you create an emotional or rational connection? Is your messaging compelling? When a website uses the same staged stock photography and me-too copy, it is doomed to be forgotten. The key is to create original content that reflects your company’s brand, values and expertise. Tell stories that help prospects understand what your company is all about. You can tell stories in the form of case studies, testimonials and compelling copy. 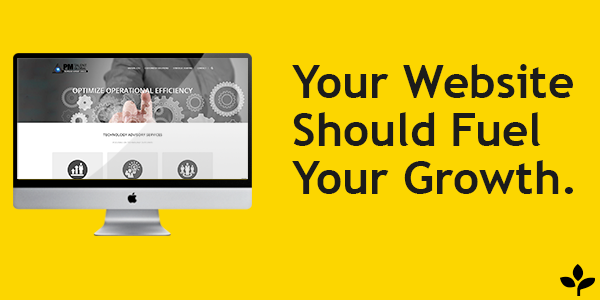 If you get it right, your website will act as a business growth engine for your company. The customer experience on your website deals with the frontend; what customers see when they visit. In order to make sure that what they see will leave them with a sense of ‘WOW’, you need to have a functional program taking care of the backend. Think of the backend as the engine of a car. Sure the car looks great with leather seats and shiny paint job (that would be the frontend of your website), but its engine is what really produces the magic. You don’t have to be a ‘mechanic’ to have a powerful backend for your website, either. WordPress, for example, is a user-friendly system that is great for most sites. According to Tech Crunch, 19% of the web runs on WordPress today. It is easy to set up and use and has excellent documentation to help you get through processes. If your website is eCommerce (you have items for sale online), consider using Magento, a powerful solution that offers support, services and training that will help your website succeed. Nothing is more irritating to a website visitor than poor functionality. Go check out any chat room and you will find that is one of the top complaints. You need to make sure that your pages are loading (displaying content) quickly and that your links are working (meaning people can access all content across the site). Website visitors want to know that the site they are on is secure, and is virus-free. Consider the best ways to have a trust symbol visible for your business. This may include listing organizations that you are a member of, your BBB rating, other customers, testimonials, and ensuring a secure payment process. You also want to make sure that any forms you have available are actually working. If a client tries to fill out a form and they get confusing errors or are unable to successfully submit their form, they will likely give up on your site and your business. Give customers the confidence that your business is legitimate by providing a functional website. The customer isn’t the only one that is trying to collect information when they visit your website. You are trying to collect information too! Decide what information you want to collect, how to best ask for it, and where to place the Call to Action (CTA) within your website’s structure. If someone is visiting the “About Us” section of your website, you may want to use a “contact us” button as your CTA, since this visitor is likely learning more about you to see if they want to work with you. If you have a website that allows users to create accounts, you’ll want to have CTAs for special offers or rewards programs that display when someone is logged in. Notice these examples are specific to what level of engagement you have had with a visitor. Lay out a plan that includes at least one CTA on each page of your website. These days, people aren’t just using their computers to view your website. Tablets and phones have actually surpassed PC’s for web surfing, but they often have a different screen size than a computer. That is why your website needs a responsive design. Using a responsive design means that the layout of your webpage will change depending on the viewer’s screen resolution. In essence, your website design will ‘respond’ to the device that the viewer is using. This will help make sure that all the content of your website is still visible while creating a positive user experience. If you still don’t think that a responsive design is important, consider that a study from the Pew Internet & American Life Project found that 21% of phone owners use their devices as their primary way of accessing the Internet, more than PCs and tablets. That means that consumers are using the device with the smallest screen to visit websites. Are you ready to take the next step with your website? Contact us to get started with your website development.